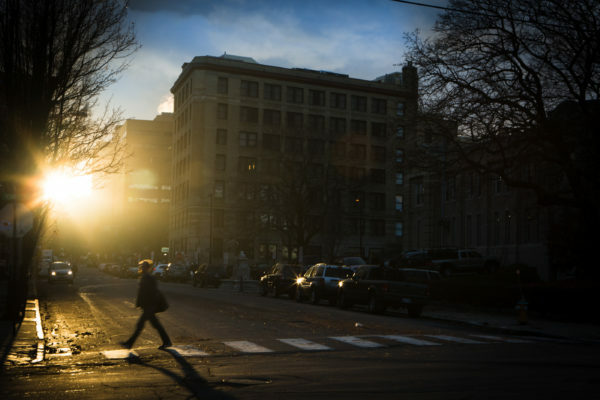 A woman crosses Federal Street in Portland in a 2016 file photo. KENNEBUNK, Maine — The local utility Kennebunk Power and Light has signed a 20-year deal that’s designed to support construction of one of the state’s largest solar arrays in operation. The utility said that it issued a formal request for solar array proposals after getting several unsolicited plans in the first half of 2016. The utility evaluated four different proposals and picked DG Maine Solar in October. In a news release, the utility said “pricing for the solar power is actually lower than the cost to purchase energy off the grid,” as it does not come with regional or local network fees on power delivered from outside the district’s territory. The Kennebunk Power and Light District is one of two such utility districts created by the Maine Legislature. The other serves Van Buren. Unlike the state’s investor-owned utilities, both districts are still allowed to generate their own electricity. The utility said it may also expand the size of the solar array through future negotiations with DG Maine Solar, for amounts up to the capacity of its West Kennebunk substation. It’s also considering additional solar arrays to serve its Water Street substation and said “talks will be ongoing” about any additional solar power. The new array would be slightly smaller than the 4.4-megawatt array completed earlier this year to serve customers of the nonprofit Madison Electric Works. The Madison array is the largest currently in operation in Maine, though the company Ranger Solar has plans for two major projects in the state. Ranger won a regional bid to sell power to a group of southern New England states, with plans for a 50-megawatt array in Sanford and an 80-megawatt array in Farmington.